The Sanborn Fire Insurance Company was founded by Daniel Sanborn in 1866 in Massachusetts, and was in existence for over 100 years. 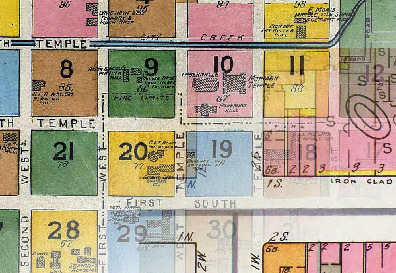 During that time, nearly 7,000 physical maps were made, and were originally intended to for assessing fire insurance liability (so, for example, if you lived in a house next to an arms factory/gunpowder manufacturer, chances are you probably had high liability). While this was essentially a physical mapping exercise, what really draws the distinction from urban mapping and urban modeling is its semantic qualities as an institution. In between volumes, updates (new drawings of new or altered buildings or lots) were created and sent out to be pasted on top of the old maps. This became an 1800’s form of user interface or semantics, and the corrections were referred to as ‘slips’ to reduce expense and preserve accuracy. While the maps ended with the birth of the computer in the early 1970s, there are four categories within which subsequent digitization attempts fall. 1. Non-semantic Digitization (i.e. single sheet scans accessed online or in university libraries and typically provided by regional institutions. 4. Semantic, geo-spatial integration with 3d structures (Though not in existence, an effort by Google to integrate 3d models based upon the Sanborn map information into GoogleEarth).